Spring and Easter time are here! This is a really cute and fun treat that your kids will love! 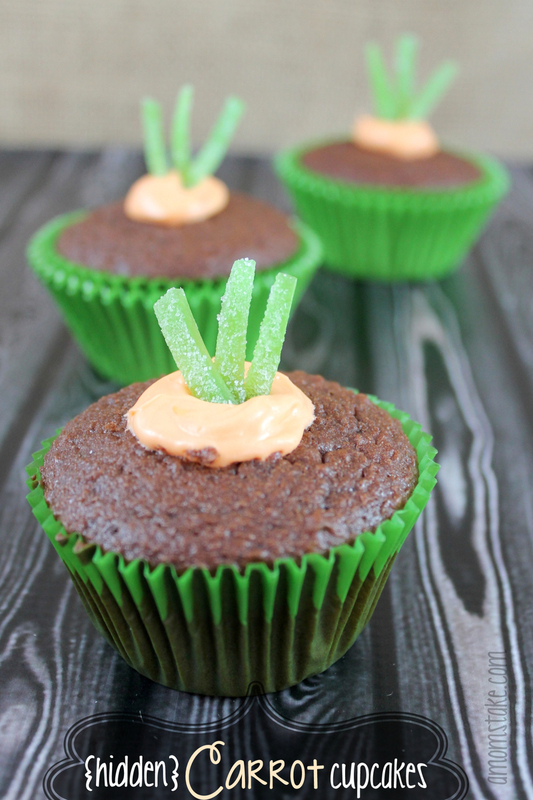 The hidden carrot cupcake will remind you of gardening and spring time! Best of all, it’s easy to make. You will need chocolate cupcakes for this recipe. You can start with a box mix, like I did, or use a favorite homemade chocolate cake mix recipe. Once your cupcakes are baked and cooled, you can decorate them very easily following the rest of these directions. Start by making buttercream frosting which will form the carrots inside your cupcakes. In a large bowl, beat the butter until creamy. Slowly add in powdered sugar, ½ cup at a time, beating well every time you add more. Next, beat in vanilla and milk and mix until well combined. Now, just mix in 2-3 drops of orange food coloring or until color is desired orange. Take a sharp paring knife and cut a cone shape piece out of the top of each of your cupcakes. Now, pipe in your frosting mounding it up above the top of your cupcake. 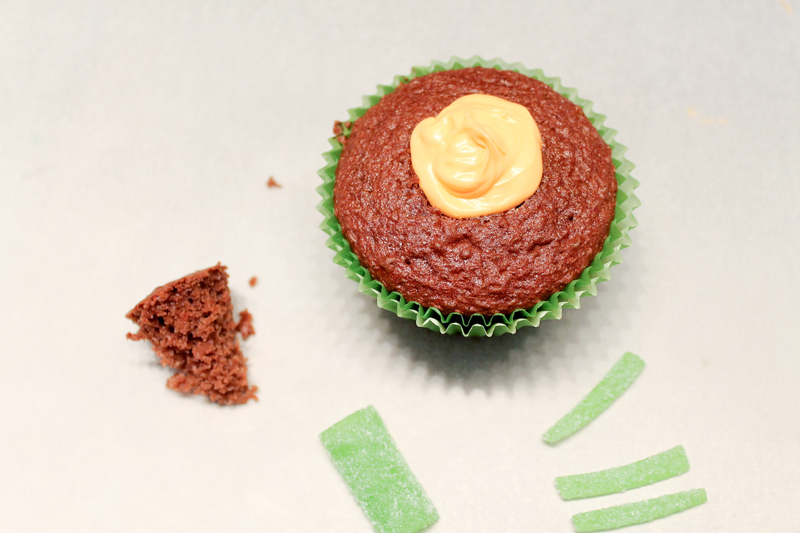 Cut green rope candy into thin pieces and add them into the frosting to create your carrot stems. That’s it, now you’ll have adorable cupcakes with frosting carrots hidden inside. The kids will get a kick out of these fun cupcakes! They won’t know you’ve hidden a surprise of more frosting inside. Serve them up at your spring parties or for Easter. The frosting being on the inside has a bonus! You get about the same amount of frosting per bite, but when your little ones grab a cupcake, they won’t end up with frosting all over their hands. 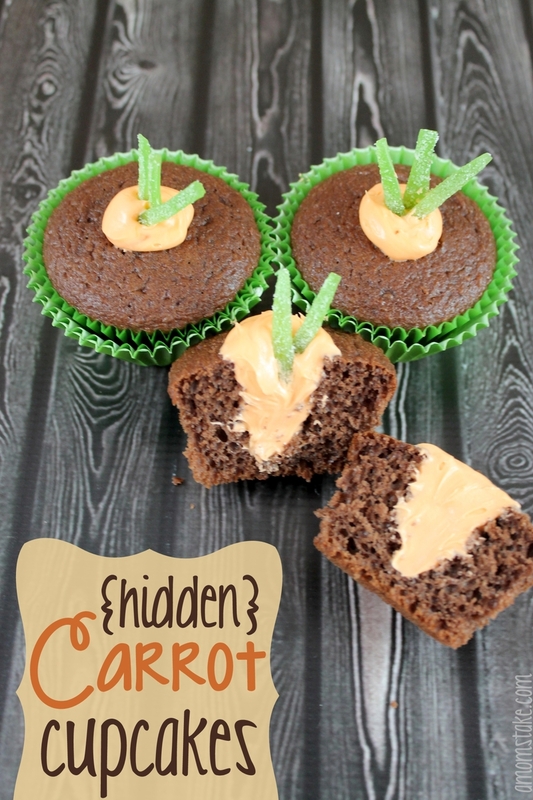 Who in your family would love these hidden carrot cupcakes?